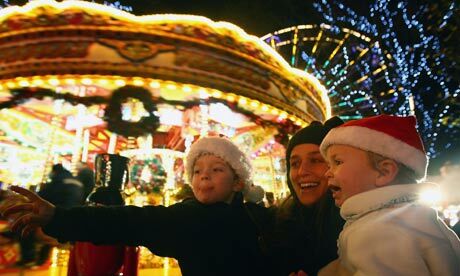 Christmas lights are shining in Edinburgh, but many local authorities cannot justify the cost. To light or not to light is proving a major seasonal dilemma for local authorities across the UK, with many deciding to pull the plug on the traditional displays of Christmas street decorations. But the cost-cutting is seen as a further blow to businesses relying on Christmas shoppers to come out in force and bring some balance to the books after a tough year for retailers. With budget cuts and rising pressures on services, many councils do not have the money to keep the lights on. Even those not cancelling the tree and fairy lights are cutting back on their switch-on events, replacing the usual reality TV star or pop band guest with the mayor or local school children. A survey this weekend found 38% of England’s villages would be without their Christmas decorations this year because of cost. “It’s not about being Scrooge, but being sensible with your budgets,” said Robert Oxley of the TaxPayers’ Alliance, which supports the cutbacks. “You get some local authorities spending tens or even a hundred thousand pounds of taxpayers’ cash on a huge switch-on when they are cutting back on essential services. In times where savings have to be found, it would seem sensible not to spend a fortune on fairy lights. In Chichester, West Sussex, businesses failed to match the £15,000 the council put in, leaving the town without Christmas lights. A collection among retailers in Newquay, Cornwall also failed to raise much cash but they are drafting in volunteers to help with their Christmas celebrations. “Our parade is really important to the town,” said the clerk of Newquay council, Andrew Curtis. “It brings a lot of people every year.” He said he had asked for more from retailers but did not get much in the current climate. Cheltenham has also cancelled its switch-on to save the £33,000 it cost the town last year. But in big cities that attract shoppers from miles around, councils are conscious they could lose custom to competing city centres. In 2009 Birmingham city council saw crowds of 20,000 when pop stars JLS were booked to switch on their lights. This year the local newspaper featured complaints that the switch-on parade featuring tap-dancing turkeys and Darth Vader had failed local businesses and left shoppers more likely to be lured by Liverpool and Manchester where X Factor stars and Girls Aloud appeared. “We believe in the current financial climate it is more important than ever to attract shoppers and other visitors to our city centre,” Manchester councillor Pat Karney told the BBC. His council had spent £50,000 on the event and tens of thousands turned up to see X Factor winner Joe McElderry press the button that lit up the city centre. The National Association of Local Councils insisted councils would be trying their hardest to find money for Christmas displays. “We know that many local councils are looking to continue Christmas lighting for their community as it brings social and economic benefits for the area,” said a spokesman. In Brighton, along with stocking their shopping streets with low-energy bulbsthere is a new plan to help retailers face economic downturn over Christmas. A project called Dressed For Success is offering expertise in festive window dressing to shopkeepers. Brighton and Hove city council has put £7,000 into the scheme to help the city’s unusually high number of independent shops which lack the financial might of a chain to support them. “Unlike chain stores, independents don’t have the backing of big organisations with lots of cash and expertise,” said councillor Amy . In my home Town Of Redditch in Worcestershire the Town centre grotto is now the size of a garden shed located outside the Debenhams store in the Kingfisher Shopping Centre and the lights hardly shout out it’s Christmas. I took Emilia my brothers eldest child for the grand switch on but we didn’t even notice they had been switched on due to the lack of them. But Redditch Borough Council switched on the outside lights on Saturday and scrooge seems to be in charge of the money pot. Yet again a huge let down but i have never understood why Councils cut back on the lights and decorations as it gets shoppers in the Town Centre spending money.Instead that money will be ringing in the tills of shops in Birmingham and Merry Hill when it could of been spent in Redditch. Residents went on social networking sites calling the lights “the big turn off” and comments on the local newspapers Facebook Page were mainly complaining that the Kingfisher Shopping Centre lights were a waste of time and the grotto looks like a garden shed.